The Exhibition continues until Saturday 21st February 2015. To trace the origins of abstracted elements found in these works, it’s worth bearing in mind that they’re ultimately derived from the observable world. Thus it’s helpful to imagine the Fife coast of the 1920s, where William Gear spent his early years, especially in the mining village of East Wemyss. Local sights of daily familiarity became indelibly lodged in his impressionable boyhood memory. These included the massively imposing twin pit heads of the Michael Colliery where his father Porteous worked, the thundering surf of winter storms pounding the coal-waste blackened beach, and the beckoning caves punctuating the low red cliffs surmounted by the stark and forlorn ruins of Macduff Castle. The towering copse of trees on his short-cut to school impinged particularly strongly – an image to be re-imagined and emerge in diverse works over several decades. And it was at his village primary school that we may find the earliest indications of William Gear’s self-perception that he had a specific artistic talent. One day, at the start of the weekly ‘drawing’ period, the class teacher put her handbag on a table, announcing that the pupil who did the best drawing of it would receive a prize—the shilling inside. When this was duly won by the young Gear, it might well have been his first inkling that he was ‘good at art’. Then in 1925 there was a significant family outing, when his mother took him to the opening of the new Kirkcaldy Art Gallery. Besides scrutinising the Scottish colourists’ paintings, he could absorb the overall public gallery setting – as a place where his art might one day also hang to be admired. As for his father’s influence during these formative years, in a 1982 radio interview he commented ‘I sometimes liked to think my father had artistic instincts’. Coal-miner Porteous had two spare time enthusiasms – gardening and photography, though he produced more than simply sepia snaps of dahlias – they included photos at the coal face. We might infer that just as he strained at the limits of what could be achieved with photography, so his son later pushed at the boundaries of what might be generally acceptable in painting. Hence creative impulses restricted by the limited opportunities and confined horizons of an earlier Gear generation were unleashed within the next through a combination of luck and greater opportunities. It was about this time that other imagery contributed to the mental reservoir which helped form the source for his artistic imagination, most notably the massive grid-like structures of the Forth Railway Bridge and, on his travelling scholarship, the gleaming tessarae of Ravenna’s byzantine mosaics. Previously aware of the latter only from black-and-white slide lectures, that first encounter with the colourful reality must have been a visual revelation. 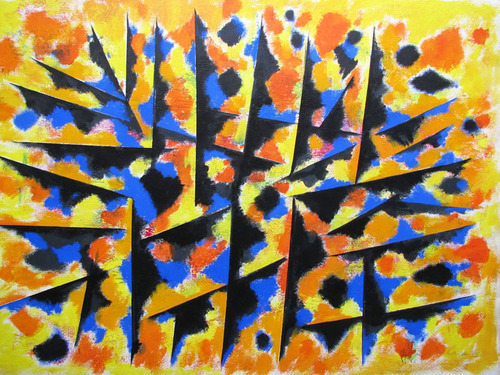 During his 1937 Parisian stay, William Gear tried to enrol at the little academy run by Fernand Léger who, looking thoughtfully through the applicant’s portfolio, instinctively tuned into the national and cultural significance of the rich dark reds, blacks and blues. He remarked to his assistant ‘Est un Russe n’est pas?’ Overhearing this assumption that he was Russian, Gear interjected ‘Non, non, Je suis un Ecosse, Monsieur!’ In response, Léger exclaimed ‘Ah, Ecossais alors; ca c’est quelque chose!’ and William Gear was enrolled. Although Surrealism was all the rage in Paris at that time, none of this would Léger tolerate amongst his students. When he set up a typically elaborate still life including a leek, student Gear, on an uncharacteristically surrealist impulse, drew the stem in a cuboid rather than cylindrical form. 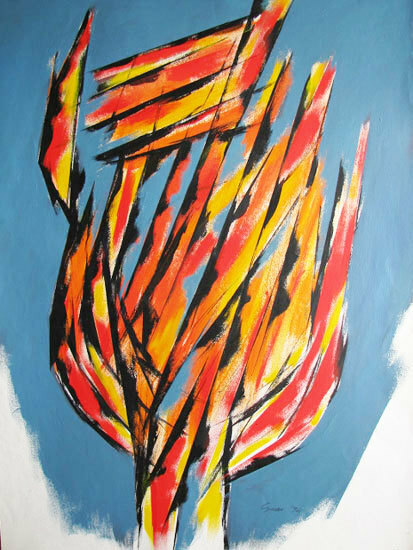 Léger commented “Mais, c’est déjà de la fantaisie”, but the encounter proved harmless, and Léger’s approach to his art became a self-acknowledged lifelong influence on the young Scot—perhaps even more so than the work of his post-war friend, Nicholas de Staël. In 1950, and now with his American wife Charlotte and baby David in tow, he ‘emigrated’ from his attic studio overlooking Notre Dame Cathedral to a rural Buckinghamshire cottage. The contrasting bucolic surroundings of the rolling Chilterns, with its patchwork of fields, woods and hedgerows, were to be a significant influence on many subsequent paintings, and the sea’s proximity became an additional intermittent visual stimulus during his time (1958–64) as Curator of Eastbourne’s Towner Art Gallery. 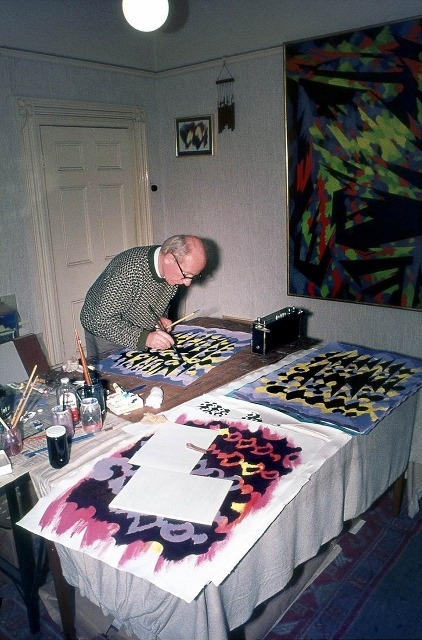 As we see from my 1975 photo of him at work in Edgbaston, during the following years experimentation ran continually as a leitmotif through William Gear’s works on paper.